Traditional Christmas cookies have never really tickled my fancy. As of late, I’ve had a taste for Heath toffee bars. It must be due to all those raids in my niece’s candy bowl this past Halloween. I probably ate them all single-handedly. 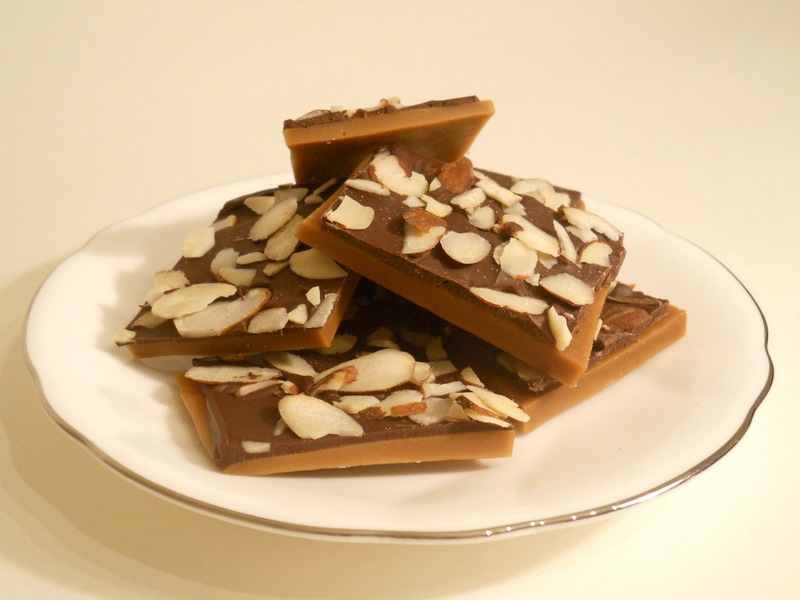 The buttery toffee combined with chocolate, nuts and a little saltiness makes my tongue do back flips! 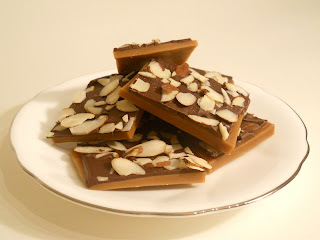 Since I’m an avid home cook I decided to try making my own English toffee for the holiday season to wrap in cello bags and give to friends as gifts. The following recipe is a combination of Paula Deen’s from FoodNetwork.com and Martha Stewart’s from MarthaStewart.com with my own twist. For someone who rarely ever makes candy I found this surprisingly easy. I may never eat toffee any other way again. Line a cookie sheet with foil and generously butter. Put butter, sugar, water and vanilla in a heavy pan or skillet over medium heat. Bring to a boil, stirring constantly, about 10 minutes. Remove spoon from pan, and cook to a very brittle stage (300 degrees to 310 degrees F on a candy thermometer). Or, make a cold water test: candy will separate into hard, brittle threads when dropped in cold water. The toffee should be a creamy caramel color when ready. Remove from heat and pour onto prepared cookie sheet. Cool completely. Gently wipe the top and bottom of the toffee with a damp paper towel to soak up excess oil. Put toffee on a clean piece of foil, parchment or wax paper and allow a few moments to dry. Melt chocolate chips and spread evenly on top of the toffee. Top with almonds and refrigerate about 20 minutes to set the chocolate. Break into 2 inch pieces and store in an airtight container. Yields 30 to 40 pieces. Please note: I have an electric stove at home so temperatures and times may vary as my stove tends to run a bit hot. I didn’t have a candy thermometer but the cold water test and a watchful eye worked like a charm. I also used a large cast iron skillet which worked wonderfully to keep the heat evenly distributed.